The Story of Jayne Jayne is the hyper-cool, laid back groove of New Orleans. A throwback to MOD vibes and good times. An easy going place to enjoy an espresso with friends, or relax over great Southern style cuisine with a cocktail that you will not soon forget. So dry off those jeans that have been soaking in the bathtub and tell your friends – “meet me at the Jayne”. Wondering about the jeans? Fashion obsessed MODs would sit in a bathtub of warm water wearing their jeans, then allow them to air dry in order to create the perfect slim fit. We had the special Réveillon dinner and each item was especially yummy. Shame restaurant is in a hotel and not noticed by lodgers or locals as a jewel during December. Restaurant was SO nice and accommodating for our large party. Food was excellent. Service was great. We really appreciated their efforts on short notice. It was good for a quick bite before a concert in the SuperDome that also had very convenient parking. The service was not that great, but the food was good. This restaurant is unprepared for special events. The waitstaff really doesn't want to be bothered with customers who are unhappy. I can't comment on the quality of the food, because other than the appetizer, we never received our food, even after waiting for over an hour. The manager ultimately comp-ed our bill, but not til we had received a check for more than $100, when all we had actually received of what we had ordered was french fries and a round of drinks! I give everyone a second chance, but due to their can't be bothered attitude, that won't happen in this case. We went to take advantage of restaurant week. The food was very good. We had Oyster appetizer, shrimp and grits, the chopped wedge salad and the fish special (pompano). Everything had a "special twist" so it wasn't like eating at every other restaurant. It is part of a hotel, so the dining room isn't luxurious but it is comfortable. Nice bar too. The only reason I may not go back is that there are so many restaurants in the area, but no complaints. And service was very attentive, but they were not at all crowded - another reason to go! Went here for restaurant week and the food was amazing. 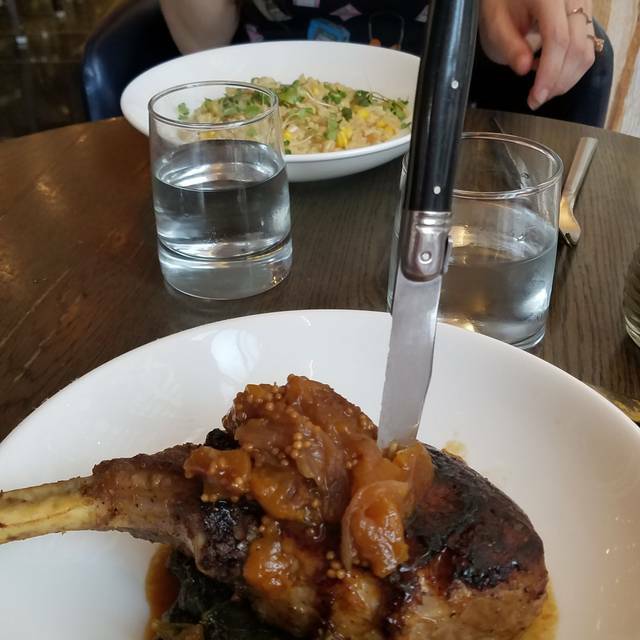 The pork chop was the highlight for us. Wait staff was friendly, but they definitely weren't in a rush. We weren't either, so we didn't mind, but some people may have wanted a little faster pace. Very small restaurant but great food! Great service, attentive friendly staff. Just bad. We were the only people there. The drinks were not great, and the one appetizer we had was terrible. We ended up leaving after the appetizer to go elsewhere. And it took longer to get our check than to get our drinks and app. Not worth a return. Maybe if you are having a business lunch right in the area, it would be palatable. But the menu is limited, and the app we had was not great. Greeted warmly, seated promptly, offered glass of wine due to happy hour. Had appetizers, salads, entrees and cocktails. All very generous portions and delicious. Went here for a Mother's Day Brunch. The place wasn't very buys, but the staff were very attentive and helpful. The chef himself was out and about, greeting customers, and he described each of the dishes of the buffet himself. There was a great selection of food items laid out and they were delicious. We especially enjoyed the crab finger salad! Decent food but incredibly understaffed. Wound up comping our entire meal because the service was so slow and one of our entrees never showed up. They need more servers and better organization for sure. Delicious food and friendly service. We even went back a second time before leaving. AMAZING goat cheese grits.